ssup update – aadhar self service update portal. If you ever wonder how to make aadhar card update details or to find uid with the help of the aadhaar self service portal. At the end, if you face any problems in the process of ssup update or tracking the ssup status online via aadhar card update portal. You can contact us or do leave a comment. The process of updating or correction changes in your aadhaar card update is quite simple. All you need to do is follow our step by step guide. In case if want to know more information you can check out below guide here. The UIDAI officially announced on their website, that who ever aadhar card has been linked with the mobile number can now access the aadhar card self service update portal. With the help of the aadhar self service portal, you can make whatever changes or updates to your aadhar card. Note: In case if your mobile number is not linked with UIDAI, then you can’t make any ssup aadhar card update changes. Below, we have written an article on how to change or link your new mobile number – please do check it out in case if you want to link your mobile number. Unlike others, we don’t want to extend the content. We will try to explain in as short as we can to make aadhar card update. Through SSUP portal – Self Service. Through Offline – Contact The UIDAI Administrative/Official Office Near By Your Location. By Sending The Post To UIDAI Office. So, first of all we would like to go for online through SSUP Self service update portal. The process is quite a simple process. In case if you have no idea how to apply for smart aadhar card – Here you will get to know. This is how the web page will look alike after you have check into that link. 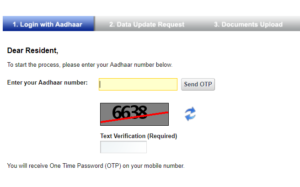 The very next step is to enter your 12 digit UIDAI number followed by captcha which is shown on the screen. If you won’t receive the OTP, then try again, untill you receive the password, Mostly you will receive the password, at very first attempt. Once, the OTP is received, the very next step is to make adhar update changes online. If you want to make any name adhar update changes, through aadhar self service update portal. Then there you go. Fill only the name blank space, if you want to make updates only to Name. Don’t add either Mr or Mrs before writing the name. Do check your 10th class memo or any other official document. The name on the document which is going to upload should match with the name on the application form that you were going to fill. If you want to change your name via ssup update – aadhar self service portal, just like above. Choose the DOB column and fill the right date of birth. Make sure that don’t enter the old date of birth anywhere on the application form. Refer the date of birth once again and submit the application form online. Note down the URN number – URN number which is used to track the UIDAI update request number status online. Below we cover on how to track the URN status online. You need to have an at least one document which has been mentioned here. Please do fill the new address, and choose the exact pin code location, city, street. Don’t enter the old address. In case, if your were unable to find your address or location on the ssup portal. Your new aadhar card will be then delivered to your new update address. Also, your documents will be then verified by the officials. So, please do update the original documents for the process of SSUP updates online. On the empty blank spaces right to your preferred choice enter the new Email Id, Mobile Number, and change the gender in case if it is wrong printed. That’s how you gonna make update changes through aadhar self service update portal, at the end you need to get the acknowledgment slip on which it note down the URN number to track the ssup status online – through ssup update self service portal. If your mobile number is not linked to the aadhar card, then, in that case, you can choose to opt for the offline method. At first, you need to contact the enrollment office which is near by your location. Here is the step by step process on how to find the enrollment office. Choose the pin code option, enter your pin code. Tick mark the permanent aadhar card update centers. Once, you click on submit. You will find the nearest permanent or locate aadhar enrollment centers. Get the application form from here. Now, fill the application on which mention what changes that you want to make actually. Contact the office and submit the application form. That’s it. Another alternative method – UIDAI officially mentioned on their website. You can even send the post if you were unable to make changes via online. That’s it. This the most used three ways to make ssup updates – through aadhar self service update portal. If you have any doubts to let us know. URN Status – What Is URN Number? URN – Update request number. When you make any update or correction changes online, the UIDAI automatically displays the URN number to track the update request status. Here we share on how to track the URN status online with the help of the ssup status update porta – aadhaar card self service update portal. Enter your URN number which is generated when you submit the online correction or update request via self service update portal. That’s it. You will get to know whether your application has been approved by the UIDAI or not. If you want to know more information about the Aadhaar self service update portal – visit our most frequently asked questions page.